The moment you go under contract on your dream home, you start imagining all of the ways you want to decorate your new home. You want to bring your dream home and pinterest board alive. Those 30 days leading up to your closing feel like an eternity while you wait for your home to close. If you are like me, you want to find unique pieces and not pay top dollar at a traditional furniture stores. 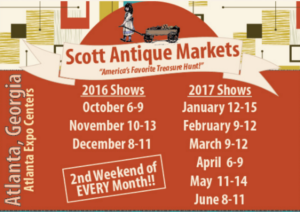 Every month, Scott Antique Market makes its way to Atlanta on the second weekend. The market opens on Thursdays and runs through Sunday. To successfully see everything, prepare for 3-4 hours. At the gate prior to parking, they do charge a $5 fee. This ticket is good for the entire show. The show in Atlanta is so large, they have two buildings and an open outdoor area. It is located in South Atlanta off Jonesboro Road. Every month this show is on my calendar. You never know what you are going to find. I tend to start outside in the picking section and see if I can find what I am looking for that may just need a little TLC. You will be amazed at how many dealers from all across the United States that are at this show. Typically the same dealers come every month. If you find something you like and want to custom order, most dealers will take orders and bring the item back the next month. The best advice I can give is to keep an open mind. Walk around fast to see everything then slow down and compare prices. They will negotiate and mark down their prices on Sundays. The dealers do take credit cards but really prefer cash. They have staff on standby to help with lifting of heavy furniture into your car.